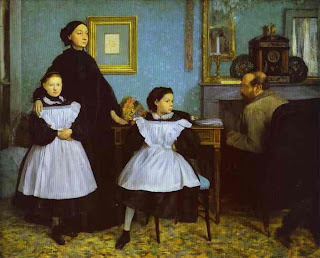 Edgar Degas was born in Paris, France, the son of a banker. His mother died when he was 13, after which his father and grandfather became his primary influences. Degas enrolled in the Lycee Louis-le-Grand, graduating in 1853 with a baccalaureat in literature. Degas started painting early in his life, turning his room into a studio by age 18. In 1853, he became a copyist for the Louvre. His father, however, expected him to go to law school. He went, but did not try very hard. In 1855, he met Jean Auguste Dominique Ingres, whom he revered, who told him to "draw lines, young man, and still more lines, both from life and from memory, and you will become a good artist." Degas traveled to Italy, where he spent three year, making studies for his early masterpiece, The Bellelli Family, and making copies after Michaelangelo, Raphael, Titian, and other Renaissance artists. By 1860, Degas had made more than seven hundred copies of works. After returning to France in 1859, Degas began working on The Bellelli Family masterpiece, while also working on several history paintings, such as Alexander and Bucephalus, The Daughter of Jephthah, Semiramis Building Babylon, and Yound Spartans. Degas' first exibition at the Salon, in 1865, was his painting, Scene of War in the Middle Ages, which was somewhat successful. After this, his paintings became more and more contemporary. His painting, Steeplechase--The Fallen Jockey signaled his growing commitment to contemporary subject matter. He was influenced primarily by the example of Edouard Manet, whp he met in 1864. Degas produced much of his greatest work during the decade beginning in 1874, after returning from the Franco-Prussian War and discovering that his brother had amassed huge debts, and Degas now had to rely on his artwork to make money, and he sold most of the art he had collected, along with his house to save his family name. 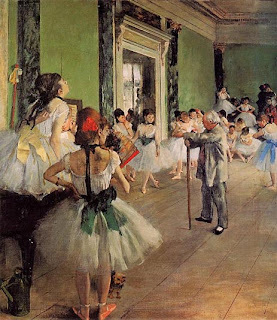 Degas was an Impressionist, and a group of impressionists got together and put on shoes, dubbed the Impressionist Exhibitions, which went from 1874 to 1886. He disbanded due to disapproval of the press's image of Impressionists, and his inability to relate to the other members of the group. Much of his work had dancers, horses, and very contemporary subject matter. His ballerina paintings were some of his most famous works.